Honor's latest phone puts the camera front and centre – and offers a few more great surprises, too. The Honor View 20 takes the camera phone into a megapixel territory that's never been seen before. This means the View 20 is a more than a solid camera performer. While it suffers a little from a lack of other lenses, the View 20 is packed with imaging smarts that are also a world's first, at a really enticing price point. The most important thing on a smartphone is its camera. This is what every phone manufacturer will now have you believe. That’s because they are all in a race, a war, to bring the biggest and best specs to the small rectangular thing in your pocket. The latest is the Honor View 20, a phone that doesn’t wow with the amount of lenses it houses, but rather the megapixels. This is the first smartphone around to offer a 48MP sensor, which immediately drops the handset into best camera phone territory... on paper at least. It achieves 48MP by making use of the Sony IMX586 sensor. This sensor was announced back in July 2018 and offers 48 effective megapixels on a compact unit with 8.0mm diagonal. It's a fantastic piece of optical engineering and a sensor that will soon be in many more phone models. For the moment, though, it's Honor's to boast about. London postbox, taken with a focal length of 4.75mm at f/1.8 and an exposure time of 1/115sec and ISO50. The innovations don’t stop there for the Honor View 20, either. On the front is an All-View display and this is thanks to another first: a front-facing ‘punch-hole’ camera. This means that there is no notch to speak of, although you can have a black bar when viewing video if you so wish. This was taken in Las Vegas with an exposure time of 1/2110sec. Honor has had to do some clever engineering to make this camera work effectively, essentially drilling into one of the 18 layers that make up the glass and placing the 25MP front camera with f/2.0 aperture there. All of this is complemented by what is a great looking handset. The back of the View 20 has a beautiful-looking v-shaped pattern that also helps when gripping the phone. There’s a volume rocker and on/off button on the right side. The left houses the microSIM, but there’s no expandable storage on board. Instead there’s the choice of a rather capacious 128GB or 256GB of storage on board. Everything is speedy, too, thanks to the 980 AI chipset, which was first found on the Huawei Mate 20 Pro. This processor means that it’s no slouch in the gaming department. What everyone really wants to know about, however, is how well it performs as a camera. You won’t be surprised to read that the View 20 is more than capable as a camera. The 48MP sensor may feel like overkill on a smartphone but it’s warranted here, to a point. The phone can’t quite match the photography brilliance of its more premium sibling, the Huawei Mate 20 Pro (Honor is a sub brand of Huawei), but that was a phone that came packing four lenses, as well as some nifty AI smarts. Las Vegas image, taken with a focal length of 4.5mm at f/1.8. The View 20 has two lenses (three if you count the 3D lens on the back that helps with depth sensing and the like) but it does a mighty fine job with these. The images we got from the 48MP sensor were crisp and rich in detail. We took a number in the full glare of the Las Vegas light, and some more in the chilled-blast of the UK. While the UK shots don’t do much to enhance the grey slate of a near-snowy sky, they do pick out details well. This close-up of a gate was taken at 48MP, using an exposure time of 1/100sec and ISO400. The textures in our shots of rusting metal and tree bark impressed us, thanks to the deep detail. The shots of buildings had nuances between the shade and light of the brickwork. Although it’s not pushed quite as hard as the AI features that can be found on the Huawei Mate 20 Pro, there are some 1,500 scenarios the phone will recognise. We are going to have to take Honor’s word for this as we just got a lot of ‘building’ and ‘green leaf’ when we were taking shots – while these descriptions were correct, and the camera adapted to these surroundings, we didn't get many more variants. The zoom on the View 20 is good. This first image was taken with a focal length of 4.75mm at f/1.8 and an exposure time of 1/358sec. This was the same image with a 5x zoom. While it's a little softer than we would have liked, the level of detail is still decent. The exposure time here was 1/100. This was done at 12MP, as there is no zoom available on the 48MP resolution. AI is baked into the View 20. If you wanted to branch out from photography, there is the ability to buy things the camera recognises, through the AR Camera functionality. This is Honor’s attempt at Google’s AR Lens. There is also Honor’s attempt at the Apple iPhone XS' Animoji on board, too. This is where the camera tracks your movement and exchanges your head for an animal of your choice. Both are fine, and fun, features but ultimately gimmicky. A place where the AI does shine, though, is when it enhances the 48MP camera functionality. Honor has added a layer on top of its 48MP sensor that is is calling 'AI Ultra Clarity'. This adds sharpness to the images, enhancing it so that any text in the image is more readable and the like. Yes, this is an algorithm adding in colours and pixels where it sees fit but we saw this work well with the Google Pixel 3 and its Super Res Zoom technology. Here it also works well, even if sometimes it is a little too over processed. While we are on the subject of the Google Pixel 3, Honor has tried its hand at rivalling Google’s Night Sight with the View 20. However, while Night Sight quality is jaw dropping, we weren’t as impressed with the night shots we took with the View 20. Our images of the recent super moon were a little blurry and while the whole image was brightened effectively, it’s not an image that we feel the need to keep. Some of the manual features available on the View 20. Where the View 20 does shine is in the manual controls it offers. Flick to the camera menu and it's almost identical to the Mate 20 Pro's. This isn't a bad thing, as it means there's a lot of camera tweaks you can make to get the best shots. If you want to put the stabilisers on, there is AF auxiliary light functionality, an assistive grid and a horizontal level option. The 4D predictive focus enables you to see the points of focus of a moving object in real time, while in Pro mode you can adjust exposure compensation, AF and AWB, and it shows you the ISO level you are shooting at. You can also adjust this, if you wish. Other modes include an Aperture mode, where you can adjust the bokeh effect accordingly. If you'd rather the phone does this automatically then you can switch to Portrait mode and it will add this effect around the person you are shooting. It does look a touch over processed, and it gets a little caught out with loose strands of hair, but this is a good feature that seems to be improving all the time. 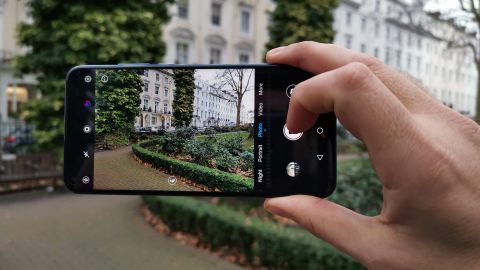 The Honor View 20 was only revealed in January and already we have a strong contender for camera phone of the year. It uses its AI smarts effectively to deliver enhanced images, but what's really exciting here is the underlying hardware. A sensor with effective 48MP and a selfie cam drilled into the front of the device, eliminating the need for a notch – these are huge leaps of innovation. Yes, we would have liked another lens or two for choice, but the View 20 is a more-than-capable camera phone with premium looks and performance at what is a modest price. Samsung, it's over to you.